Our #1 seller. Made from sweet cream corn, they’re crispy, golden and served with delicious cinnamon butter. Plump, all-white chicken tenders fried Southern style. Dip’Em in bleu cheese, ranch, or our signature BBQ sauces. Crispy skins with cheese, bacon, and sour cream. Served with Marinara and batter fried to perfection. Filled with cream cheese with a little kick. Fried to Perfection with a kick! Build your own from our 44 item salad bar. Unlimited selection with lunch or dinner. Top it with your choice of: grilled chicken, BBQ pork, BBQ beef, turkey, or chicken tenders. Smoked and deep fried to perfection. Slow cooked ‘till fork tender, then char-grilled with our sweet sauce till caramelized. A full 23 oz. per rack! All dinners include garlic toast and your choice of two sides: Cole slaw, baked beans, French fries, baked potato, sweet potato, green beans, broccoli, or mac ‘n cheese. Enjoy our tender, slow-smoked chicken, juicy and full of true barbeque flavor. Plump, all-white chicken tenders fried Southern style. The best BBQ pork in Broward. Satisfy your BBQ cravings. Cooked slow & low, tender with just the right spices, delicious! A healthy choice, all breast meat, amazingly moist and tender. amazingly crispy and light. Served with tartar & sliced lemon. Grain fed, then aged for an authentic steakhouse flavor. St .Louis trimmed, basted with our signature spices then slow smoked to perfection. Quarter Chicken, Spare Ribs, Pork, Beef or Brisket. If you like prime rib, then you’ll love these ribs. Baby backs with 3: quarter chicken, pork and beef. Our succulent baby backs w/ tender slow-smoked spare ribs. 1/2 pound of spare ribs. Cole slaw, BBQ Beans, French fries, Baked Potato, Sweet Potato, broccoli, green beans, or mac ‘n cheese. Our burgers are made from grain-fed Angus beef - thick‘n juicy. Lettuce, tomato, pickle, or onion upon request. 8 oz (Angus Beef) Grilled to perfection! This burger is loaded!! Cheese, Bacon, Cajun, BBQ sweet sauce and topped with crispy onion rings. This one packs a Punch!! Loaded with BBQ sauce, pepperjack cheese and jalapenos. Makes your taste buds smile the Cajun way. Jumbo, Stuffed, Baked Potato Loaded with cheese, bacon, sour cream topped with Turkey, Pork or Beef. We hand slice it and pile it high. You’ll love it! Select: BBQ Beef, sliced Pork, pulled Pork, or smoked Turkey Breast. Our famous special recipe sauce mixed with a tasty blend of pulled Pork and Beef. Served on a toasted garlic bread or bun. Big appetite? Plow into our mega-sandwich. It’s made with choice BBQ meat—lean, juicy and slow-smoked over a real black jack oak fire—then hand sliced and piled high. Includes cole slaw. out deliciously crispy and light. With grilled onions, green peppers, and cheese. Slow cooked every day, then cut and pulled to order. Fried or Grilled. Bleu Cheese or Ranch. Satisfy your hot dog craving with our signature all-beef version grilled, bursting with flavor. Smothered with chili and shredded cheddar. All family feasts are served with cole slaw, BBQ beans, garlic toast and your choice of French fries, sweet potato, baked potato or broccoli. Basted with our secret spices and then slow smoked to perfection, more than enough. Two full slabs of our succulent, fall-off-the-bone Danish delicacies. Sweet, smoky spare ribs are even better when shared, (They also travel particularly well, making them ideal for a picnic.) Our family pack also comes with a whole chicken — slow smoked on our pit until it's juicy and tender — as well as a satisfyingly large bowl of BBQ beans, Cole slaw, choice of four potatoes, four pieces of fresh garlic toast and four pieces of corn on the cob. Slow-smoked chicken, tasty spare ribs, juicy beef and meltingly tender pork. 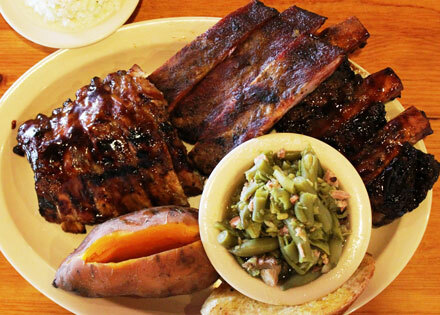 A generous sampler of everything we do in our real wood-burning pit, this is a favorite of true barbeque fans. The Wagon comes with a large bowl of BBQ beans, Cole slaw, four potatoes, four pieces of fresh garlic toast and four pieces of corn on the cob. You can try it all at once — and usually take some home too. Waffle Cut, sweet, with a hint of cinnamon. Nutritious! Crinkled-cut Idaho potatoes, crisp ‘n’ golden. A real treat topped with cinnamon butter. Regular or fried crispy and light. Fresh, steamed and served piping hot. Always room for another veggie. Crusty and garlic buttery. You’ll swoon. A healthy classic, char-grilled, slathered with our Sweet BBQ sauce, and served on a crisp lettuce leaf with a slice of tomato. Pulled or sliced BBQ Pork ~ slow cooked, tender and moist~ the real McCoy! BBQ Beef ~ lean cut of grain-fed beef, slow smoked over an oak fire. Hand-Sliced Smoked Turkey ~ our succulent, all white turkey breast is lightly smoked and comes out amazingly moist and tender. A healthy choice! Plump, all ¬white chicken tenders fried southern style. Ideal for dipping in bleu cheese, ranch dressing, or our signature BBQ sauces. Two quarter-pound, all beef franks, served with a double portion of BBQ beans. Hand-breaded and southern fried; our fresh fillet is deliciously crispy and light. Served with tartar sauce and sliced of lemon. Our signature dessert: Vanilla cake filled with fresh strawberries, bananas, pineapple, vanilla pudding and whipped cream. A yummy chocolate dessert with creme filling & Oreo crust. A chocolate crust with homemade peanut butter filling, and topped with whipped cream. Our homemade-light and creamy key lime pie is served in a graham cracker crust.